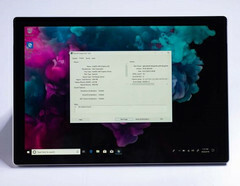 The sixth version of the Surface Pro 2-in-1 tablet was supposed to finally include USB-C connectors, but an early unboxing unveiled that this may not be the case. The overall design appears to be almost unchanged, however, the hardware was upgraded with gen 8 Intel ULV CPUs and improved iGPUs. The official unveiling is scheduled for October 2. Microsoft’s latest Surface device is scheduled to be unveiled on October 2, but it looks like review devices were sent ahead of the official release, as Nguyễn Đức on Youtube posted an unboxing of the Surface Pro 6. Looking at the overall design changes, Microsoft only added slightly more rounded corners, while the stand and detachable keyboard remained practically the same from the fifth version. The model featured in the unboxing video is powered by Intel’s gen 8 Core i5-8250U ULV CPU coupled with 8 GB of RAM and 128 GB storage, but there will also be i7-8550U models with 256 GB storage, apparently. Unfortunately, the new Surface still does not come with the much-requested USB-C connectors, just the usual USB-A ones. Youtube commenters were quick to point out that this is most likely fake, because Microsoft surely must have included USB-C connectors in this new model and the design appears to be the same from the 2017 model. While these concerns are quite on point, we only have to wait a few more days before Microsoft officially confirms these specs.